Major US indices were very volatile yesterday, the Dow moved sharply higher at the open, then gave back some ground but managed to remain firmly positive throughout the trading session adding 290 points to close at 25825. The jump on Wall Street reflected a positive reaction to the meeting between President Donald Trump and President Xi Jinping. On the US economic front, the PMI release showed an unexpected acceleration in the pace of growth in manufacturing activity in the month of November, whereas construction spending unexpectedly edged lower in October. Looking ahead, traders are likely to stay on the sidelines today with a lack of major economic data and fundamental highlights. Trading 109 points lower after the open, the stock index managed to reverse during the session as bulls took control ending the day up 290 points in a very volatile trading session. 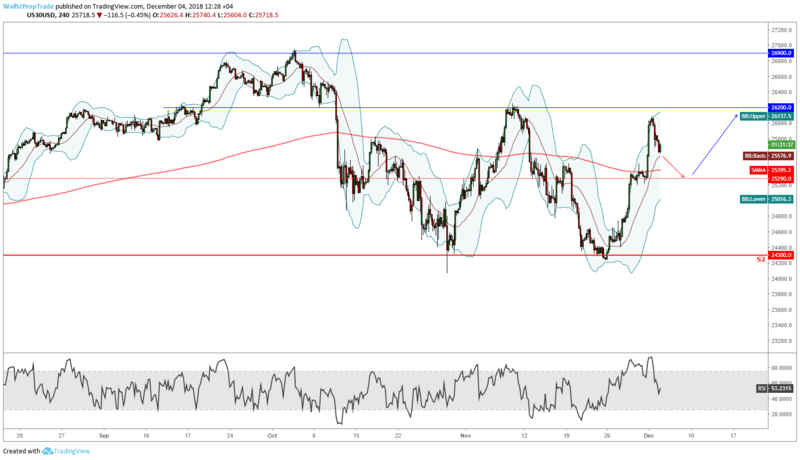 The DJIA shows strength in the short-term supported by its long-term uptrend, and further buying today might move prices higher should the market test the key resistance level at 26200 or November's nearby high at 26277 in extension. It is also worth noting that the index broke through the 100-day SMA, which sets a positive note for today's session. The support now is at 25290 which is also near the 200-period moving average on the 4H chart.